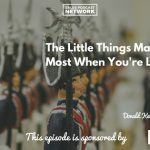 Home » TSE Podcast Post Page » TSE 908: Lifter Leadership-How To Innovate, Engage, Build Trust And Be Purposeful All At Once! For sales leaders, improving your team’s numbers isn’t always enough. If you can help your team innovate, engage, build trust, and be purposeful, you’ll lift your team up and improve their lives. Lifter leadership will change your sales team and change your company. 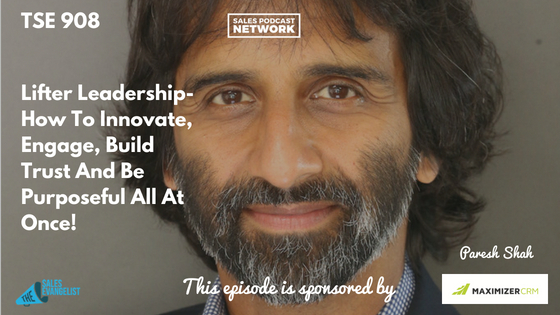 On today’s episode of The Sales Evangelist, Paresh Shah, author of the upcoming book Lifters, talks about why his methodology is important for sales efficacy, and how Lifter leaders help companies address disruption and innovation. Paresh helps governments, large companies, small companies, and entrepreneurs solve their biggest problems. His company, the Non-Obvious Company, is named that because he said that obvious thinking won’t solve big problems. Statistics suggest that customers only trust 55 percent of companies today, so the first obstacle companies have to overcome is distrust among its customers. Lifters are the new leaders of the world. These leaders help their customers and their coworkers find a better way of being. They lift their coworkers and other people around them by creating a better work environment, characterized by positivity, integrity, authenticity, value, and creative expression. Lifters lift their companies, and as a result, they drive more revenue and more loyalty while they lower costs and innovate. They lift their world and their companies at the same time. Lifters see beyond transactional relationships. As Paresh became more mindful throughout his career, he discovered that humans are fundamentally changing the way they connect with one another. As part of that, the model for how to transact, sell, and run and build a business was fundamentally being reset. 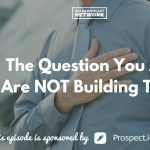 That led him to the Lifter paradigm, where he realized that the sales process wasn’t really about hunting for customers, targeting them, capturing them, segmenting them, and analyzing them. Paresh realized that model no longer works. Lifters understand that it’s about helping customers, inspiring them, serving them, and lifting them. It’s a whole different model. As a result of his shift, he’s happier, he’s making more money, his customers are his friends, and everything is working better. 1. The hunt is over. The days of hunting for your customer are behind you. It’s about serving, inspiring and lifting now. 2. Truth or consequences. We must be authentic and have integrity in everything we do as leaders. 3. “Yes and” people. They are multitaskers. They bring great value to the people they manage and to their customers because they are good at a variety of things. 4. Lifters take Invictus action. In the movie with Matt Damon, victory wasn’t winning. It was bringing people together under a common purpose. Lifters attract customers and inspire them. We do have to take action, but we don’t do it with a poverty mindset. We shift into a generosity mindset and ask how we can help. Paresh teaches that we are all energy. We are not separate people. Lifter leadership shifts into a mindset of compassion, caring, creativity, and interconnectedness of everyone. We’ve shifted to a higher consciousness, and people, the younger generation especially, can feel inauthenticity. People will quickly call us out for lack of authenticity. If, for example, we’re building wells for people in Africa, but we’re polluting a river with the byproducts of our products, people will call us out for it. Lifter leadership turns the whole model upside down. How do you show up in the moment? Are you seeing the interconnectedness of all the people you interact with? If you don’t become a Lifter leader, you will be left in the cold. Paresh quotes a Harvard Business Review article that reported that companies that operate with conscious purposeful principles like Lifter leadership perform 10.5 times better. In the early days of farming, families engage in subsistence farming in which they worked together all day every day to raise enough food to support their own needs. At some point, non-obvious innovators had a different idea: to rotate the crops instead of planting the same crop in the same place every time. They used massive scale agriculture to change the world, and these farmers were the rock stars of innovation. It freed up labor and people started moving to the cities. Eventually, the Industrial Revolution began. If you were someone who could automate work processes or create a non-obvious idea for how to streamline a factory, you were a rock star. New rock stars who understood automation and other concepts like steam and mass manufacturing eventually launched mega-companies like Rockefeller and Carnegie. The next group of rock stars created the companies that run the world right now, like Google and Apple and Microsoft. They created a whole new world with the Internet, information, and software. Initially, those people were nerds and geeks, and they were outcasts. They were on the fringe of society until someone realized we needed to pay attention to them. These people understood something other people didn’t, and the companies that embraced and nurtured them became rock stars. The companies that didn’t embrace them were obliterated. Lifter leadership isn’t just about sales. Lifter leaders have workers that are engaged who will walk on fire for you. Seven out of 10 workers are disengaged because we aren’t giving them Lifter leadership. Connect with Paresh Shah at his website where he has a diagnostic for our listeners to help them determine their Lifter capability. Visit www.iamalifter.com/salesevan. Also, check out his TEDx video about Lifters.